Don’t become emotionally attached to your hosta. It became somewhat of a theme this summer, waves of ancient, narrow-leaved, plain green hosta besmirching garden and foundation beds of homeowners I encountered, who became unsettled, at the very least, when I suggested that a terrific first step in renovating their landscape would be to dig them all up and get rid of them. You’d think I had told them I’d like to remove the 270-year-old red oak that anchors their front yard, and is on the US Park Service National Register of Historic Trees. These are curios, I’d explain, no more valuable than anything in that box in the basement that you haven’t looked at (or thought about) in the past 30 years. 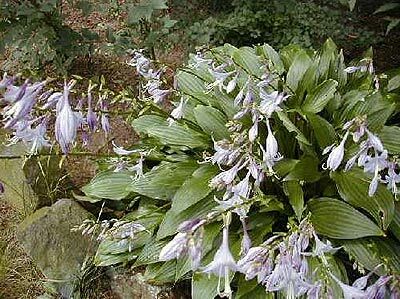 Planted in shady spots across America five and six decades ago, this failed perennial prototype is usually H. lancifolia, registered with the International Registration Authority for Hosta…in 1888. 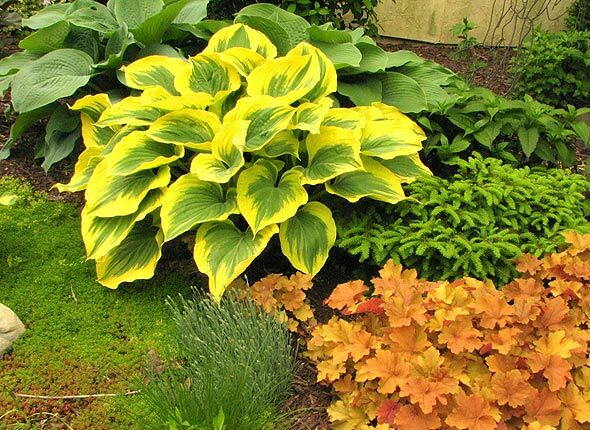 Planted as a single specimen, surrounded by varied shade perennials and hosta of a higher order, they’re serviceable. Except starting in the 1950s this and other plain green varieties were planted en masse, great fields of them wafting from vast foundation beds to turgid seas of back (and front, and side) yard groundcover. Hosta landscaping from the 1960s, variety thankfully unknown. They’re green, sure enough, with drooping leaves about as wide as men’s ties in the ‘70s. They flop up to a mature height of around twelve inches and spew lavender flowers in late summer. Yeah yeah. 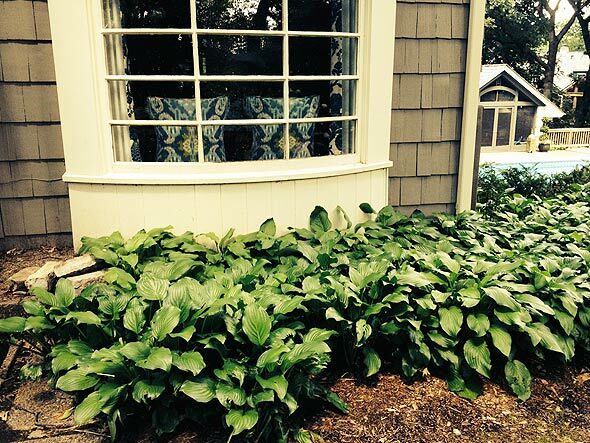 Compared to about 6,000 newer hosta varieties, their aesthetic qualities are nil, and “disease resistant” is not a quality included in their genetics. It’s time homeowners screw up their courage and do these hosta a grave favor: These weary, generations-old apparitions should be told, “Go to the light,” so they can finally cease their material sentence on earth. Except they’re in the ground and they’re alive and that apparently means something, but all it means is there’s an unhealthy, off-kilter emotional attachment between human and plant going on that’s unique to botany. Perhaps they remind some homeowners of their childhood, plausible if you bought your parent’s home after Dad died and your mother went into the nursing home. In that case, they are indeed the vey same plants you remember growing up with as a kid. Wouldn’t you rather have this? This bizarre attachment really does pertain only to ancient Hosta. I can suggest removing 35 dogwoods of the same era, and the homeowners will respond sure, whatever. But you have to design around the bed of 500 hosta, they’ll tell me. Or can you dig them up and replant them? How about digging them up and hauling them to your city’s weed and yard waste disposal center? Somewhere in your county they accept worn out plants and turn them into compost. That’s where everything I tear out of clients’ yards winds up. Or toss them all on your own compost bin. If you don’t have one, this would be a great opportunity to start. Fill as large a bin as you can build with these old hosta, root ball and all. Have a second bin for finished compost, and as you slowly extricate these ancient urchins from your property, when it comes to compost, you’ll have a lifetime supply.